The equine attorneys below are listed under the states in which their firms have primary office locations. In addition, they are often available to consult with attorneys in other states. When contacting an equine attorney, be mindful of the fact that they may represent the other party in your case. Accordingly, keep your emails or telephone messages short and to the point, and don’t forget to include your full name, telephone number, a very brief description of what your case is about and the other parties involved in the case. Are you an equine attorney? 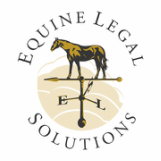 Please contact Equine Legal Solutions to place your contact information in our directory or to update your current listing. All listings are complimentary and provided simply as a resource for our website visitors.